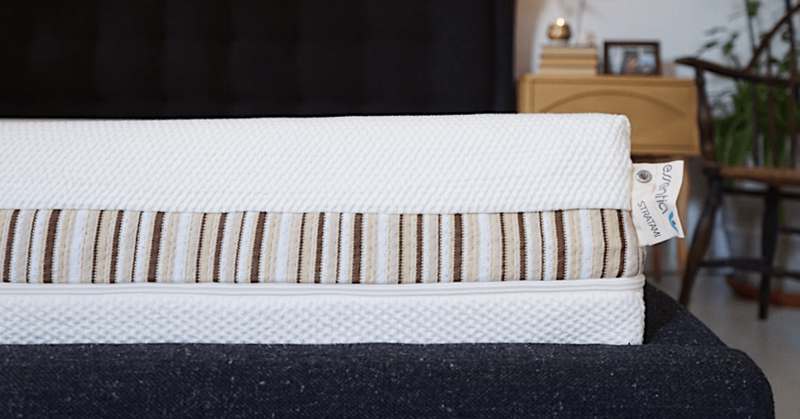 What to Look for In a Memory Foam Mattress | Essentia | Organic Essentia Mattress Inc.
Home // Mattress 101 // What is a Memory Foam Mattress? A good night of sleep on a comfortable mattress without having to toss and turn all night is a luxury. Today, when everyone is chasing his/her dreams, a refreshing great night sleep is a necessity. The quality of your sleep can affect much more than how well-rested you look. Sleep quality has a significant impact on mental acuity, reaction times, overall health, and mood. Globally, physicians, chiropractors, and physiotherapists recommend a memory foam bed and a memory foam pillow for their patient’s due to the foam layer and its elastic ability to conform to our individual body shape and curves and for pressure relief. Many individuals do not realize that memory foam dates back to the 1960’s, but since its origination memory foam has become more and more popular when used in consumer products. You may be wondering, are you compromising your health and a restful night sleep by choosing the wrong bed? Choosing the right mattress and pillow for you can have a tremendous impact on your sleep and your health. To help you understand what a memory foam mattress is, we have put together an introductory guide that explores the history of memory foam, why memory foam mattresses have gained popularity in recent years, aspects of memory foam mattresses to consider before selecting the right one, and the benefits of a memory foam mattress. To understand how memory foam originated and has evolved in the marketplace, it is important to examine the history of memory foam. Memory foam actually originated at the National Aeronautics and Space Administration (NASA) in the 1960’s. As the United States raced to be able to land on the moon, the National Aeronautics and Space Administration was faced with countless issues that needed to be resolved in order to send an astronaut into space safely and comfortably. The National Aeronautics and Space Administration knew that they needed to place a premium on the comfort of their astronauts as they would be faced with an extremely challenging and stressful environment. To ensure that the astronauts remained comfortable, the National Aeronautics and Space Administration worked to develop a material that was capable of quickly molding to the astronaut’s body to relieve stress. This hugging material would help to alleviate pressure from the intense G-forces astronauts would face on their mission. In 1966, the National Aeronautics and Space Administration successfully completed its creation of memory foam to address concerns about the comfort of the astronauts. Memory foam would remain the property of the National Aeronautics and Space Administration until the 1980’s. In the 1980’s, memory foam was primarily used in the development of athletic equipment or within hospitals. During the 1980’s memory foam was not used in mattresses. In 1992, the first memory foam mattress was revealed to consumers, and in the intervening years, its popularity has continued to skyrocket. Why are Memory Foam Mattresses Increasingly Popular? Memory foam mattresses are popular and highly recommended due to their ability to form your body shape which significantly reduces pressure points, improves blood circulation and provides an overall superior good night sleep. A memory foam bedwill take its shape around your body supporting every curve guaranteeing you a comfortable and restful nights sleep. Memory Foam is a soft and heat sensitive material made from polyurethane with some additives to increase its density. Memory foam regains its normal shape when pressure is no longer applied. Aptly named, the ‘Memory Foam’ bed has the ability to remember and return to its original shape much like our own ‘memory cells’. Memory Foam is sensitive to body temperature and molds itself to support all your body contours. Memory Foam redistributes body weight and provides support to your neck, back, shoulders, knees, and legs. Memory Foam improves circulation and reduces spinal pressure. Memory foam is also known as ‘Visco Foam’. Viscoelastic foam is the scientific term for memory foam. You may wonder what adds memory to memory foam; it’s the density characteristic of foam that adds ‘memory’ to the foam. What is a Plant-Based Memory Foam Mattress? Other companies claim to have plant-based memory foam mattresses; however, they aren't actually plant-based. Mattresses claiming to be plant-based are actually petroleum-based with some plant ingredients. Only 20% plant-based ingredients go into these "eco-friendly" mattresses, 80% is petroleum-based chemicals. Read more about plant-based memory foam here. The density and firmness of memory foam make it unique. A high-density memory foam layer = better quality than low-density options. In the market, memory foam is available from 1.5 lbs. to 5.3 lbs. and most commonly available densities are 3lb, 4lb, and 5lb. The firmness of memory foam usually ranges from 6 to 40 ILD. Memory foam is generally denser and heavier which in return gives more support compared to other mattresses available in the market. One of the reasons that the popularity of memory foam mattresses has risen in recent years is the number of substantial benefits they offer. Memory foam mattresses boast a number of benefits that will help to improve your sleep. Below are a handful of the most striking benefits memory foam mattresses offer. Memory Foam is Temperature Sensitive: Memory foam beds are sensitive to temperature, at a lower temperature it is harder, and when at a warmer temperature it becomes soft and recoils. Usually, a memory foam bed is harder at room temperature and when your body comes in contact with memory mattress it softens and shapes accordingly to your body shape. You can see this in action by simply applying pressure to the memory foam mattress with your hand, it will leave an impression of your hand when removed, and this is because your body heat allowed that one area to heat up and get soft while the rest of the mattress stays hard. This is what causes the body cast or feeling of being stuck in a traditional memory foam mattress. Memory Foam Supports Back/Spine Alignment: One benefit of memory foam mattresses is that they support each part of the body by evenly distributing your weight across the surface of the bed. This allows the mattress to support each part of the body evenly. The memory foam will form to the natural curves of your body, which will aid in supporting the lower back. In addition, this curve-hugging property ensures that the spine remains in a neutral position, which helps to prevent injury or discomfort. In spring mattresses, weight is consolidated into certain areas on the mattress, which tends to result in a lack of support on the lumbar area of the back, excess pressure on the shoulders, hips, and heels, and an increase in tension and pain due to a lack of support. Memory Foam Relieves and Prevents Pain: While other types of mattresses induce pain, memory foam mattresses help to relieve and prevent pain by providing comprehensive support to the body and unique pressure point relief. The majority of individuals that own a memory foam mattress report experiencing less pain, particularly in their back, hips, and shoulders. Memory foam mattresses are especially well-suited to individuals suffering from conditions that have chronic pain, such as arthritis and fibromyalgia. Memory foam helps to make sure that the body is properly aligned, and that additional pressure is not placed on areas of the body that are sensitive, which helps memory foam mattress owners to sleep comfortably throughout the night. Memory Foam Offers Superior Durability: Another benefit offered by memory foam mattresses is their superior durability and lifespan. High-quality memory foam mattresses can last between eight and ten years. In addition to this longevity, memory foam mattresses are much less likely to experience sagging, which frequently occurs in innerspring mattresses. While memory foam mattresses may be an investment, it is an investment that is well worth it to have a mattress that is supportive and long-lasting. Memory Foam Mattresses are Low-Maintenance: Many individuals place value in buying products that reduce and limit the amount of time and effort they need to expend in maintaining those products. Memory foam mattresses are an ideal choice for individuals looking for a low-maintenance, high-quality mattress. While electronic mattresses may experience difficulties with their technology that will require costly repairs, a memory foam mattress will not experience this type of issue. Many innerspring mattresses will require flipping, rotating, and spring repairs over the course of their lifetime, which can be a hassle for the owner. Memory foam mattresses only require the occasional rotation and vacuuming to maintain their form and substantial benefits. Memory Foam Mattresses Accommodate a Variety of Sleeping Positions: Each individual determines the right position to sleep in that feels comfortable for them, and these positions can range from sleeping on your stomach to your side, to your back. No matter which position you feel most comfortable sleeping in, a memory foam mattress will support your body and provide you with optimal comfort. Memory foam mattresses will help to cradle your body and alleviate pressure on the joints and body. Memory foam is also available in a range of different firmness options, which allows you to tailor your mattress to suit your sleeping position and firmness preference. For individuals that prefer to sleep on their stomach, a memory foam mattress will help relieve pressure points and maintain the shape of your back. For individuals that prefer to sleep on their back, a memory foam mattress will support the lumbar section of your spine which will promote maximum relaxation. For individuals that prefer to sleep on their side, a memory foam mattress will accommodate the hips and shoulders concurrently with the waist to ensure that the spine remains even. Memory Foam Mattresses Offer Pressure Point Relief: As mentioned above, memory foam was once introduced and used in hospitals to help patients remain comfortable. When an individual is in the laying position for an extended period of time, gravity will exert pressure downward while the bedding material will resist upwards. This dynamic can result in damaged soft tissues and can affect the circulation of blood throughout the body. Memory foam was introduced within hospitals to help reduce pain to sensitive areas of the body and to prevent pressure sores. In modern memory foam mattresses, these benefits remain true. Memory foam does not apply pressure upwards onto the sleeper, unlike many other types of mattresses. Instead, memory foam mattresses offer pressure point relief by contouring to the body and cradling its curves. With the best memory foam mattress, like Essentia, say goodbye to stress and strain and hello to a sound restful night sleep. You get all the benefits of memory foam we spoke about above with the added benefits of natural and organic ingredients for a clean air environment, as well as patented processes can be especially helpful to allergy sufferers. Your allergies may be exacerbated by the mold, dust mites, and pet dander found in many types of traditional mattresses. Essentia natural memory foam mattresses patented processes result in extremely dense material, that is capable of repelling dust mites and limiting other allergens from invading the mattress. You won't find any nesting grounds for dust mites as you would in traditional mattresses like wool, feather, or other fibers. In addition, it is important to target a mattress that is made from natural memory foam. An organic, natural memory foam mattress will limit exposure to VOC’s and harsh chemicals. Give your body the luxury of memory foam and let the technology work while you sleep. Essentia mattresses are made with the world’s only natural memory foam. Essentia’s natural memory foam is crafted with high quality and organic ingredients that safeguard you from inhaling the harsh chemicals that many other mattresses contain. Get a natural memory foam mattress and enrich your future with beautiful memories.